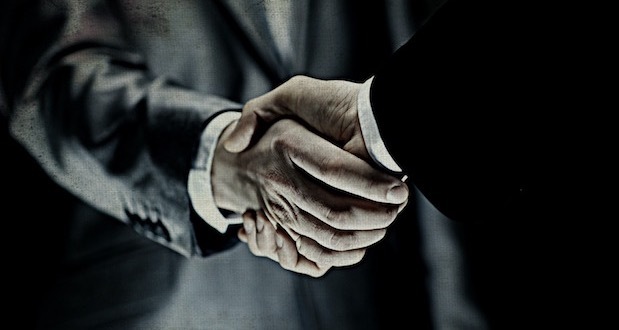 BAYER-MONSANTO: A “MARRIAGE MADE IN HELL?” | "Global Possibilities"
• Founded in Barmen, Germany in 1863 by Friedrich Bayer and his partner, Johann Friedrich Weskott. • During World War 1, Bayer turned its attention to the manufacture of chemical weapons including chlorine gas. • In 1925, Bayer, BASF, and Hoechst merged to form the massive German conglomerate Interessengemeinschaft Farben (IG Farben) which was the single biggest donor to Hitler’s election campaign. • IG Farben built the concentration camps at Auschwitz to supply slave labor for the nearby IG Farben plant (also known as IG Auschwitz). Hitler eventually used these same camps in his megalomaniacal attempt to exterminate the Jewish race. • A subsidiary of IG Farben manufactured and supplied Zyklon B to the SS. This poisonous cyanide-based pesticide, on which IG Farben held the patent, was used during the Holocaust to annihilate more than 1,000,000 people in the concentration/extermination camps. IG Farben also supplied the SS with the Methanol used to burn the corpses. • In 1946, the Nuremberg War Crimes Tribunal concluded that without IG Farben the Second World War would simply not have been possible. • At Nuremberg, Fritz ter Meer (an executive of IG Farben) was convicted of slavery, mass murder, and crimes against humanity. After serving 5 years in prison, he became Chairman of the Board at Bayer in 1956, a position which he held for almost a decade. • In 1962, just fifteen years after they were convicted in the Nuremberg War Crimes Tribunal, Bayer, BASF and Hoechst were again the architects of the next major human rights offence when they established the Codex Alimentarius Commission. • In the 1990s, the federal government launched an investigation on Bayer’s unethical billing practices on Medicaid program and the Department of Justice found Bayer guilty of fraud. Bayer had to pay $14 Million to settle charges of causing inflated Medicaid claims. • Yaz (approved by FDA in 2006) and Yasmin (2001) were revolutionary birth control pills that use a synthetic hormone called drospirenone (DSP). Yaz or Yasmin have led to hundreds of deaths in young and healthy women. • The drug Trasylol was banned in 2006 after it contributed to thousands of deaths in patients every single month for over a decade. After a 2006 study showed widespread deaths associated with Trasylol, it took FDA and Bayer almost two years to take the drug off of the market. Later on it was revealed that Bayer had buried evidence of Trasylol’s severe side effects. • In 2008, the German Coalition against Bayer brought a charge against the Bayer Board of Management, with the public prosecutor in Freiburg accusing Bayer of contributing to the mass death of bees all over the world through its aggressive pesticide marketing. Since then, the bee debacle has only grown worse, with thousands of hives collapsing after poisoning by the pesticide clothianidin, producing a worldwide crisis. • Monsanto was founded in 1901 in St. Louis, Missouri, by John Francis Queeny, a 30-year veteran of the pharmaceutical industry. Its first product was the artificial sweetener Saccharin, which Monsanto sold to the Coca-Cola Company. • During World War II, Monsanto played a significant role in the Manhattan Project to develop the atom bomb. • In 1944, Monsanto began manufacturing DDT, which was banned in 1972. • Following World War II, Monsanto championed the use of chemical pesticides in agriculture, and began manufacturing the herbicide 2,4,5-T, which contains dioxin. 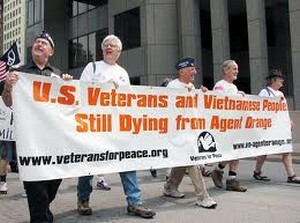 During the Vietnam War, the U.S. military initiated an herbicidal warfare program using Agent Orange (a mixture of 2,4,5-T and 2,4-D and had very high concentrations of dioxin) as a defoliant. • In 1982, Monsanto genetically modified a plant cell for the first time. • In the mid-1980s, Monsanto purchased G.D. Searle, the chemical company that held the patent to aspartame, the active ingredient in NutraSweet. Monsanto was apparently untroubled by aspartame’s clouded past, including a 1980 FDA Board of Inquiry, comprised of three independent scientists, which confirmed that it “might induce brain tumors.” The aspartame business became a separate Monsanto subsidiary, the NutraSweet Company. • In the late-1980s and early-1990s, Monsanto spent almost $500,000 to defeat Proposition 65 (California’s anti-toxics initiative which prohibited the discharge of chemicals known to cause cancer or birth defects into drinking water supplies) and Proposition 128 (California’s pesticide regulation initiative that would have phased out Monsanto’s product alachlor, which is linked to cancer). During the same time period, Monsanto also conducted the first field tests of genetically engineered (GMO) crops. • In 1991, Monsanto was fined $1.2 million for trying to conceal discharge of contaminated waste water into the Mystic River in Connecticut. • In the mid-1990s, Monsanto developed their controversial cattle drug, recombinant bovine growth hormone (rBGH or rBST), which is produced through a genetically engineered E. coli bacteria. • During the same time period, Monsanto was ranked 5th among U.S. corporations in EPA’s Toxic Release Inventory, having discharged 37 million pounds of toxic chemicals into the air, land, water and underground. Monsanto was ordered to pay $41.1 million to a waste management company in Texas due to concerns over hazardous waste dumping. • In 1996, Monsanto introduced “Roundup Ready Soybeans” and “BT Cotton” then in 1998 “Roundup Ready Corn” was introduced. • By 2007, Monsanto’s GMO seeds accounted for over 90% of the world’s supply. • In 2010, former Monsanto lobbyist Michael R. Taylor was appointed as Deputy Commissioner of Food Safety at the FDA (the fox is guarding the henhouse). 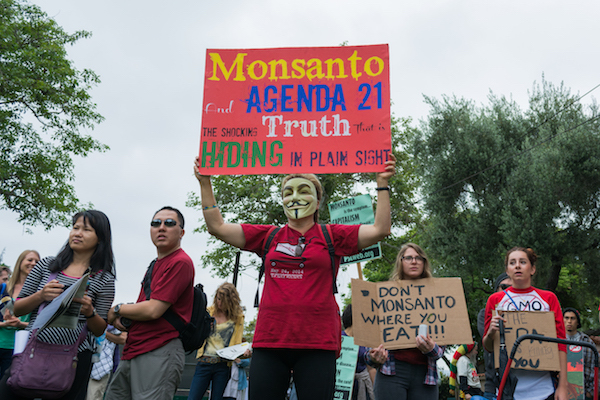 • Since 2012, Monsanto has spent more than $25 million to fight state ballot initiatives to label GMOs and millions more to lobby Congress against mandatory GMO labeling. Perhaps Monsanto thinks that if it changes its name, that we will forget its poisonous past. Think again Monsanto.